If you were hoping for a close race for the win all the way down to the wire, this race would have been a disappointment for you. On the other hand, if you are a fan of races where one guy checks out and is never challenged the entire time, this race would have left you smiling and high fiving. In his first race aboard the RCH Suzuki, Ken Roczen took the lead away from Andrew Short on the first lap and simply disappeared. Behind him Jason Anderson rode to a lonely second, although had he started with Roczen he may have had a shot at making a move—he didn’t let Roczen’s gap get any bigger and even spun a few faster laps. Behind Anderson a battle raged for third between Andrew Short, Trey Canard and Ryan Dungey. Canard was able to inch away while Dungey and Short went at it for almost the entire race. Dungey was finally able to make a pass stick with just a few laps remaining. Unfortunately, there were plenty of crashes that affected a few of the preseason title favorites. Eli Tomac went down twice all by himself and Davi Millsaps went down while running in the top five. Millsaps would later crash again when he and Seely went down together in the sand. 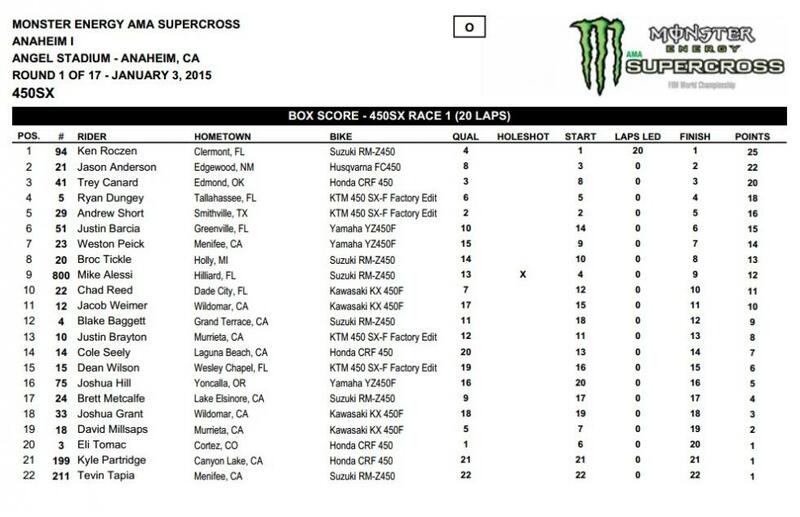 Seely ended up fourteenth while Millsaps and Tomac took nineteenth and twentieth. Check back later tonight for a more extensive report of tonight’s action. So far some pretty wild action had come from the 250SX ranks, and the 250 main held true to the trend. Except for Jessy Nelson that is, who took the holeshot and never looked back, going wire to wire to win his first supercross race. There was plenty of mayhem behind him, however. Early in the race Malcolm Stewart, Cooper Webb, and Austin Politelli all got together and went down, resulting in a DNF for Stewart and Politelli going a lap down. Shortly after, Matt Bisceglia went down in a corner and lost a ton of spots. Later Darryn Durham and Cole Martinez rubbed in a rhythm section and both crashed hard and were knocked out of the race. Durham’s crash looked especially violent—he got separated from the bike and slammed into the face of a jump. Elsewhere Josh Hansen was running in the top three early but started fading. Late in the race had a mishap and went off the track, although he was able to salvage ninth. Osborne had a great night to finish in a lonely second after hurting his thumb in his heat race. 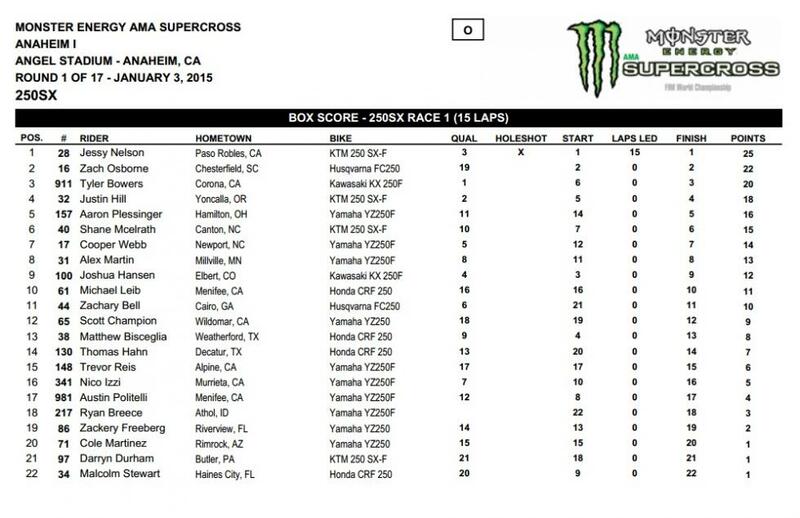 Tyler Bowers worked his way to third, Justin Hill took fourth and Aaron Plessinger rounded out the top five, nearly catching Hill for fourth on the final lap.